Windows SteadyState - a free DeepFreeze? For quite a while, the program Faronics DeepFreeze has been the standard program for locking down Windows installations against abuse by end-users. 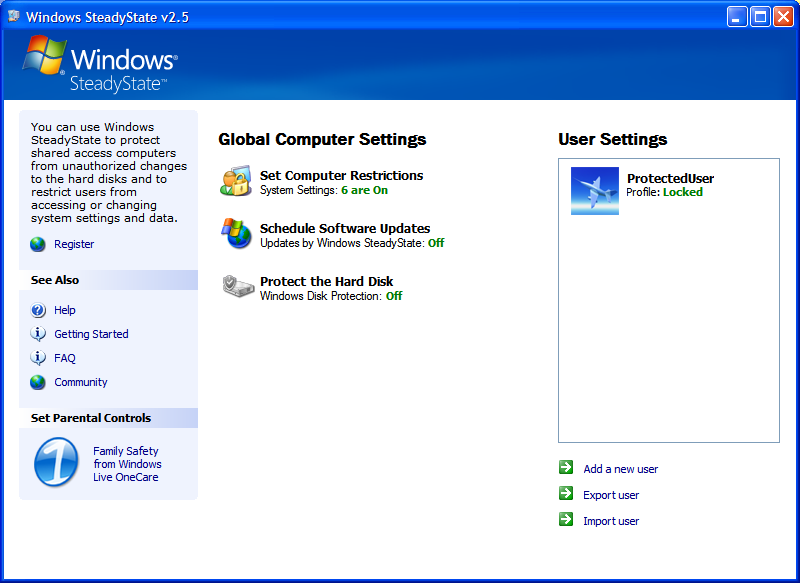 However, now even Microsoft themselves are trying to obtain a piece of this pie with a new freeware called Windows SteadyState. Select the “Protect the Hard Disk” option. However, this new program also has some limitations, such as no Group Policy integration, no ability to choose which drives to freeze and no full protection like those offered by DeepFreeze. However, this program is much more cheaper than DeepFreeze ($0) and is suited for those who don’t need the full protection of DeepFreeze. You can download Windows SteadyState here, but your systems must be able to pass WGA successfully. If you can’t or don’t want to install the WGA component you can directly download it from Microsoft.